Two days before U.S. president Barack Obama’s visit to Moscow, Russian leader Dmitry Medvedev has sent him congratulations on July 4, U.S. Independence Day. "We are actively preparing for your visit to Moscow. We proceed [from the assumption] that specific results will be achieved at the summit, which should open new prospects for the development of our ties for the benefit of Russian and U.S. nationals, for peace and progress," Dmitry Medvedev said in his message to the American president. Earlier, Kremlin aide Sergei Prikhodko said that, along with a key framework arms control agreement, two presidents are expected to sign deals which will expand the country’s bilateral military ties. That might include the agreement on transit of U.S. military supplies via Russia to Afghanistan. There are also hopes that the visit might help improve relations between NATO and Russia, after a period of coldness. John Beyrle, U.S. 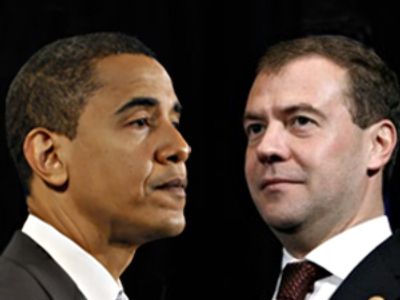 Ambassador to Russia, said that the whole world is anticipating the outcome of the upcoming meeting between Medvedev and Obama. Meanwhile, Andrew Somers, President of the American Chamber of Commerce in Russia, said that better Russia – U.S. relations would assist business cooperation between the countries. He also added that the American business community is “cautiously optimistic” about the upcoming summit and expect several business deals to be signed. Meanwhile, America’s Independence Day is also being celebrated in Russia. Just outside Moscow, a big party with many activities and fireworks is being held to mark the day. The celebration is labeled as one of the largest held outside the United States. No less than 15,000 people have shown up to play sports, watch concerts and take part in other events at the beautiful Kuskovo park just outside Moscow.